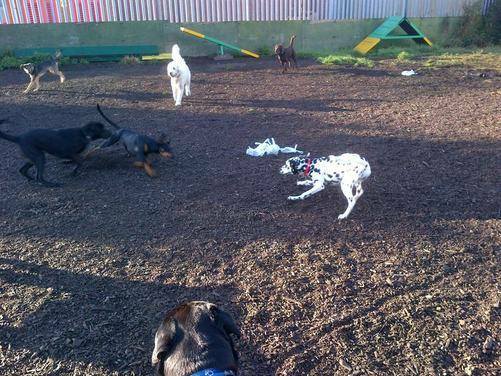 Doggy Day Care Creche, Hull - Let your dogs run and play all day. Oakwood was the first day creche to open in Hull and the second in the whole of the UK. We have been running since 2008 so you know you are getting experience when you book with us. 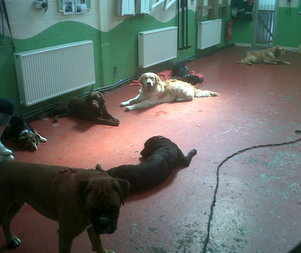 We have now improved our service to be a Doggy Day School rather than a day care. In 2016 we changed the service we provide to local dog and puppy owners, we became the first Dog Day School in the area. We are Hull's first dog day school, that has staff who are qualified in Applied Animal Behaviour and Training to degree level, you will not get this level of experience or qualification with any other day school. This means your dog will be learning while they are with us. Ideal for Puppies up to a year old - who need to learn how to behave around other dogs. Maybe they are shy or nervous or maybe they are too boisterous or over the top? Ideal for young dogs that need more exercise than you can give them, as young dogs some will need lots of stimulation - we can provide both physical and mental stimulation throughout the day. Is ideal for puppy & dog owners whose dogs need to learn. 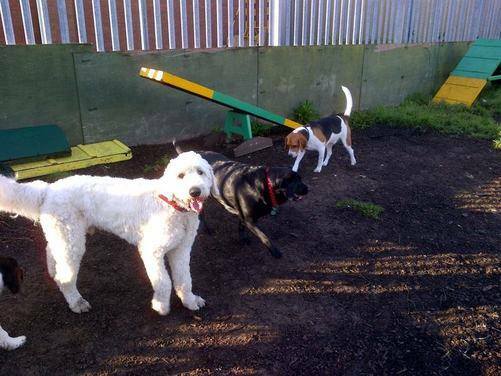 It is a fun, playful environment; perfect for social dogs; which means, if you work full-time or struggle to give your dog adequate exercise; you can leave them at Oakwood in the safe knowledge that they are playing with their friends under the supervision of our trained staff. Fulfill and enrich your dog's day by dropping them off for either a full or half day. You are guaranteed to reap the rewards of a truly shattered dog and a quiet evening! Does your dog need training? Do they jump up, do they lack self control, do they struggle to behave on a lead? We can help with all these behaviours whilst your dog is with us as Oakwood Dog Day School. 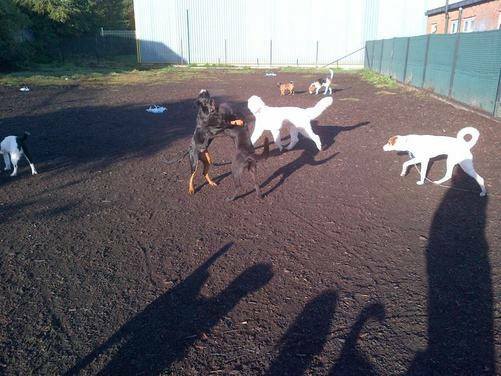 At the school your dog will enjoy running and playing in the large indoor hall and outdoor field area with around 10 other dogs. They will have endless fun with games of fetch and football, although beds are provided in the hall throughout the day should your dog want a rest at any point. Puppies Under 6 Months get their first day FREE! Please call 01482 823555, option 2 to be sent your voucher. Puppies, small and older dogs are not kept separate as it is important for all dogs to learn to interact with others and not avoid them. 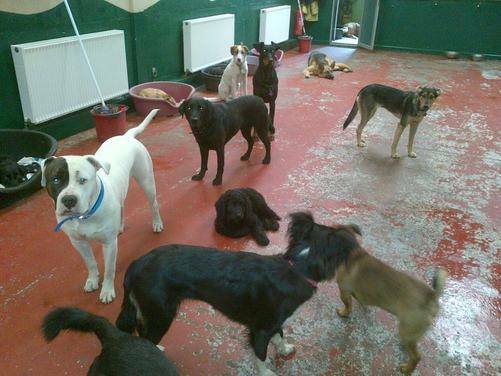 The school is heavily supervised at all times and all dogs are assessed before being able to use the facility. 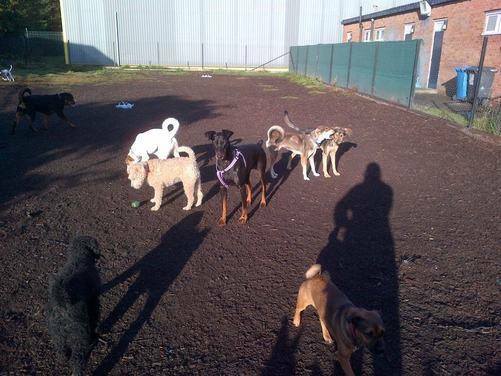 It is not a place for rehabilitation of dogs that don't like other dogs, it is a fun place for playful, active dogs. Dogs over 6 months require an assessment before being able to use the service, we also require male dogs over 6 months to be castrated, unless they were using the service prior to being 6months old. FOR DOGS OVER 1 YEAR PLEASE CALL US TO DISCUSS FURTHER. For clients using our services every week, we can offer a further discount. The cost per day is £22.50 if paid monthly in advance, providing the service is used weekly. Cancellations of less than 48 hours are non-refundable and fully chargeable. Cancellations of block bookings must be 7 days before the 1st booking and are subject to a £5 administration fee. Late pick ups are subject to a charge. Late payments are subject to a 5% surcharge. For those people on block bookings please keep track of when your payments are due. For full terms and conditions, please click here.